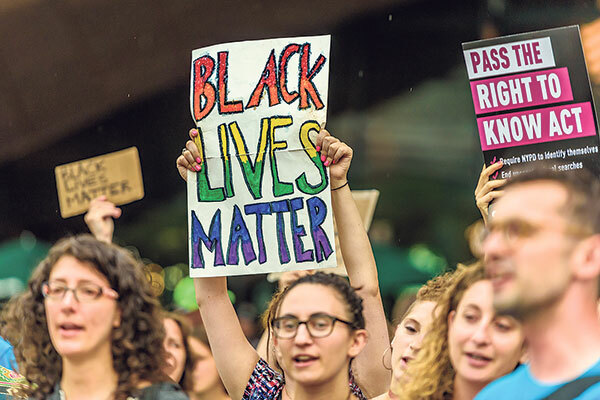 The Jewish community in New York held a rally for the Black Lives Matter movement outside the Barclays Center in Brooklyn, July 28. NEW YORK — The coauthor of the Black Lives Matter platform passage accusing Israel of “genocide” defended the term, saying Israel’s actions fit in its wider definition. Ben Ndugga-Kabuye coauthored the statement along with Rachel Gilmer, the former board member of a Zionist youth group. Ndugga-Kabuye said he understands why Jewish groups disagree with the statement but was perplexed that it has received so much attention. He compared it with the accusations of genocide that black activists have leveled at the United States, and he called the Israeli-Palestinian conflict one of many international conflicts U.S. black activists feel connected to. The platform, released Aug. 2 by The Movement for Black Lives coalition, is largely a statement of the goals of a movement that coalesced around protests of police violence directed against black people in the United States, mass incarceration of African-Americans, and other domestic issues. But it also calls for ending U.S. military aid to Israel and accuses Israel of being an apartheid state. The platform includes a link to a website promoting the anti-Israel BDS — boycott, divest, and sanctions — movement. A string of Jewish organizations, including the Anti-Defamation League, the Reform movement, and National Council of Jewish Women, has condemned the “genocide” and “apartheid” language as well as the BDS endorsement. T’ruah, a rabbis’ human rights group that opposes Israel’s West Bank occupation, also criticized the document. Most of the organizations took pains to note that they are sympathetic to other parts of the platform, many of which jibe with liberal Jewish positions on the criminal justice system, economic justice, and immigration. Ndugga-Kabuye said state actions don’t need to rise to the level of the Holocaust or other historical genocides to deserve the term, which he said could connote unjust state killings of a disadvantaged group. He compared his usage of the word to We Charge Genocide, a group that opposes police violence in Chicago. Ndugga-Kabuye said the Israeli-Palestinian conflict is just one of many international issues the platform comments on — including the dangers African migrants face in crossing the Mediterranean Sea, or conflicts in Somalia, Colombia, or Honduras. He said the passage on Israel is longer because “there’s a certain prominence to it, and that may require us to go a little more in detail.” But he said the statements about other conflicts, charging the United States with imperialist actions, are just as strong as the language condemning Israel. The vast majority of the platform addresses issues unrelated to the Israeli-Palestinian conflict. Its six sections deal with physical, social, economic, and political discrimination against black people. Among its list of demands are free universal education and a universal basic income for black Americans, an end to capital punishment, the demilitarization of police, a broad reform of the prison system, and reparations for black Americans. In addition to demanding an end to foreign aid for Israel and Egypt, the platform calls for divesting from the fossil fuel industry and reducing the U.S. defense budget. The platform accuses the U.S. of subjecting black Americans to “food apartheid” and “educational apartheid.” In both cases, it claims the government has deprived black communities of access to the same resources enjoyed by white Americans. Gilmer, the coauthor of the Invest/Divest section, told the Israeli newspaper Haaretz her father is African-American and her mother is Jewish. She is a former board member of Young Judaea, a Zionist youth group, although she no longer identifies as Jewish, according to Haaretz, and has become an anti-Israel activist. Now she is chief of strategy for Dream Defenders, a black community organizing group based in Florida. Dream Defenders released a statement doubling down on the genocide language. 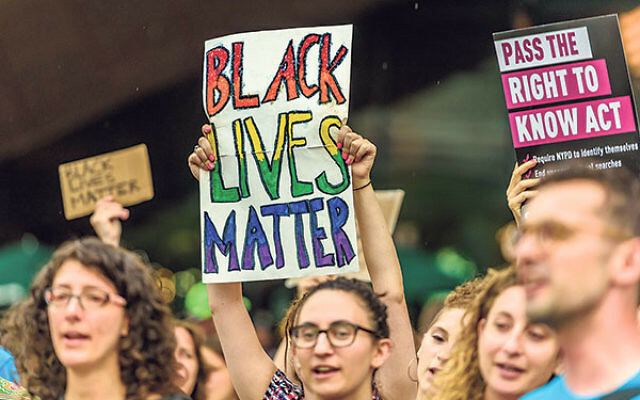 It accuses pro-Israel critics of being “wolves in sheep’s clothing” for supporting the Black Lives Matter movement only as long as it supports Israel. It asserts that Israel committed genocide during its 1948 War of Independence, as some 700,000 Palestinians were expelled from Israel or fled and were prevented from returning. Fighting Israeli “apartheid,” the statement says, is inseparable from fighting racism in America. It calls on its allies to join the BDS campaign. On Aug. 4, Jewish Voice for Peace released a statement from a group called the Jews of Color Caucus backing the platform’s section on Israel. Ndugga-Kabuye said he understands that the genocide term could prevent some Jews from joining the Black Lives Matter movement, saying it was “something we have to consider, but it’s also something we have to accept.” He said negative Jewish reactions to the platform recalled the later years of the 1960s civil rights movement, when white and black allies split over tactics and ideology.